A financially struggling team has asked its own fans to sponsor an upcoming match and it seems the plan might just pay off. So far, Crystal Palace F.C. 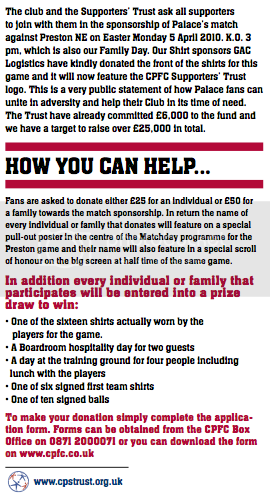 has raised £20,000 in fan sponsorship, in £25 and £50 increments, of its requested £25,000 to play the April 5th match with Preston NE. Not discounting the feat, the sum pales in comparison to the some £20 million the club is said to owe ex-chairman Simon Jordan. The 'fan sponsorship' may, however, help entice new financial backers, the team's leadership has said. Alan Lewis, Crystal Palace FC Supporters' Trust board member, said: "We want to show potential buyers that the supporters can work together with the club and be a powerful force." Each fan that takes part in the sponsorship will have his/her name featured on a special poster in the matchday program for the game as well as on a special scroll of honor on the giant screen and be entered into a special drawing. The team's shirt sponsor, GAC Logistics, has even donated the shirt that day to the cause. In place of the firm's logo will reside the CPFC Supporters' Trust logo. "We have been extremely pleased with how it has been received and we want to thank those who have already pledged their money for this initiative," Chief Executive Phil Alexander told cpfc.co.uk. "But there is still a long way to go and we are continuing to look at different ways of spreading this message to encourage more and more fans to back the club in its hour of need."